This is pretty easy: spread peanut butter on a slice of bread, scatter the dates over it, and then lay down the potato chips. Close the sandwich and eat it. 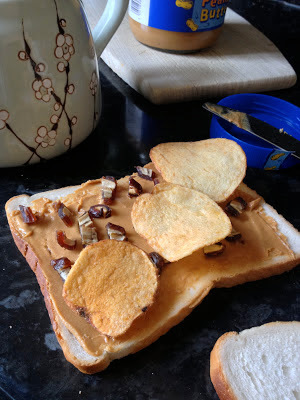 Interestingly, the dates are needed to bring out the flavor of the chips -- I couldn't taste them in early versions of this sandwhich wherein the fruit was omitted. Meanwhile, when I tried just peanut butter and dates it begged for something crunchy to be added, so in went the potato chips.